There’s been a lot of change at Vango over the last twelve months not only have they spent a lot of time re-engineering their fabrics, but they have also replaced a lot of tent tent models. One of the new and most notable of which is the Tahiti 600 / 800 XL which is only differentiated by an extra bedroom pod. It’s got to be said that this tent feels extremely spacious, which is thanks to Vango’s, new Villa construction. 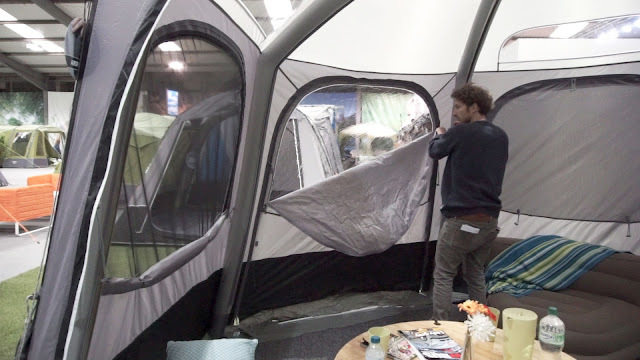 Near vertical side walls provide standing height from edge to edge, and when compared to the Illusion 800XL, which is also a very big tent, the Tahiti feels much bigger. A Multi-Flex front door offers a bewildering 18 different configurations and a full width door inside the “conservatory” allows separation between wet and dry rooms. The bedrooms, as you might expect from such a large tent are equally roomy with the title of “Super King” bedrooms which can easily accommodate double airbeds or camp beds. Earlier this week BMW’s Design works and North Face unveiled something rather special. 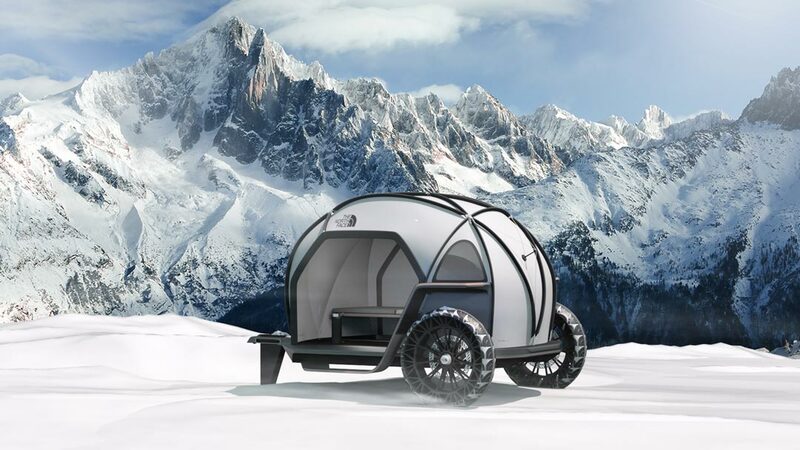 Meet the trailer tent of the future. BMW’s Designworks is no stranger to creating eye catching prototypes and The North Face are pretty adapt at man handling materials in to ever lighter weatherproof and breathable fabrics. So, it shouldn’t really come as a surprise that the two have joined forces to build the FUTURELIGHT camper, a cutting-edge concept “to imagine the future of protection from the elements”. But it does. Not so much for the North Face who specialise in high tech mountaineering tents not to mention mountaineering clothing for the brave few. 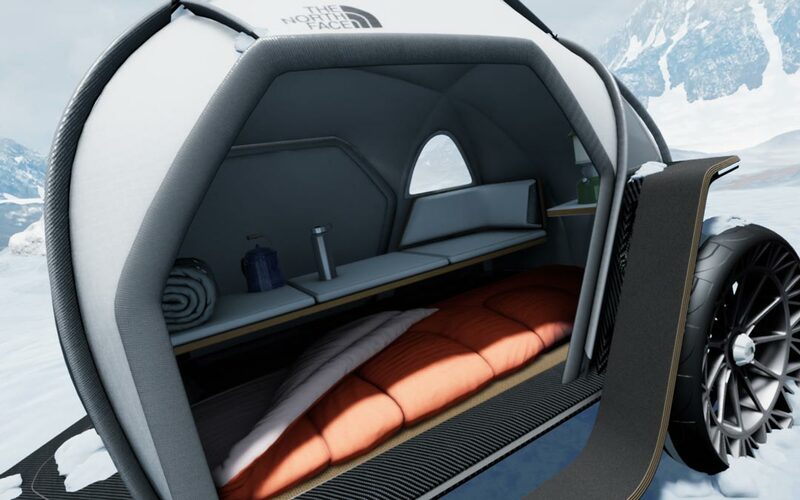 For BMW’s Designworks however a camper seems, well, a little trivial for a company currently working on Virgin’s Hyperloop One as well as BMW’s own luxury cars. The true purpose of this collaboration is to showcase The North Face’s new fabric innovation FUTURELIGHT which “uses Nanospinning technology to create the world’s most advanced, breathable, waterproof material”. This new material allows air to permeate the membrane of the fabric via nano-sized holes whilst retaining complete waterproofness. This fabric will be used across The North Face’s premium line of pinnacle performance collection from late 2019. 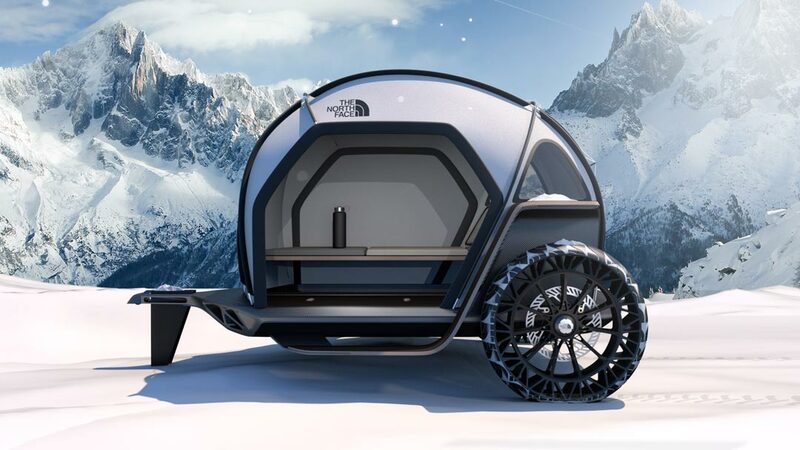 The camper, which is more like a trailer, features the fabrics stretched under a geodesic dome creating a waterproof and breathable outer shell. The interior utilises a split-level design with raised seating/sleeping and lower level sleeping floor section. Information, quotes and images courtesy of BMW Group. It’s got to be said that Vango somewhat leads the way when it comes to van awnings. 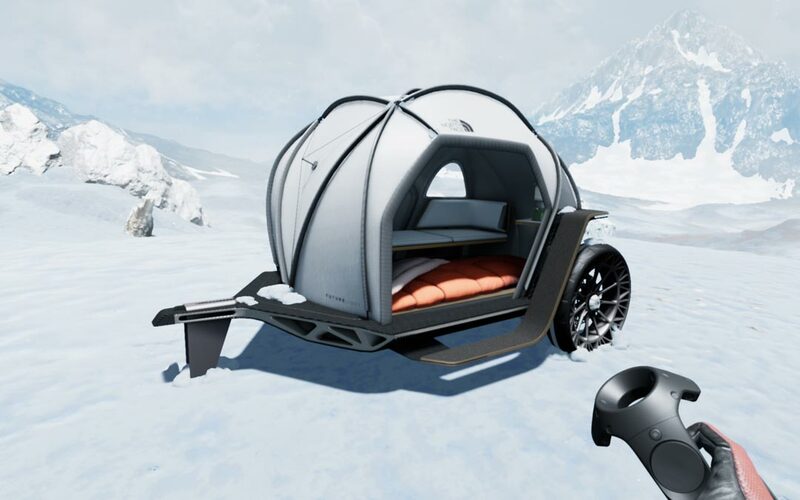 Their first air awning, the Kela was revolutionary when released back in 2013. The inflatable "AirBeams" made pitching a breeze and saved campervan owners a ton of stress compared to their cumbersome, poled counterparts. Fast forward to 2018 and the AirHub HexAway is one of Vango’s latest awning designs with a focus on providing extra living space over extra sleeping areas. Based on last years Hex Event Shelter, the HexAway features a clever airframe which allows all in one inflation via one of the three valves. Inflation times are also helped by the sleek, double action pump which makes light work of blowing up all six arms in just a matter of minutes. While the six-sided shape is probably the most obvious difference that sets this awning apart from others. Another feature would be just how open it can be. All six sides have openings (three doors with windows and three mesh windows), when fully open this leaves the awning feeling incredibly light and airy. When all the doors and windows are shut the space feels adequately private and the three Skylights allow in a reasonable amount of light. SkyTrack II is a nice feature in all Vango tents and awnings this year, the track is a handy system that allows the hanging lights and accessories from pretty much anywhere along the beams. As also utilised in all Vango’s awnings, is a Sentinel Pro 420 denier, rip-stop fabric which is more than up to the task for short to mid length trips here in the U.K. The groundsheet is a floating, toggle-in type which is maybe a negative for some as it won’t be as weather-proof as sewn-in groundsheets. But this could also be advantageous on the few campsites where sewn-in groundsheets are not permitted. 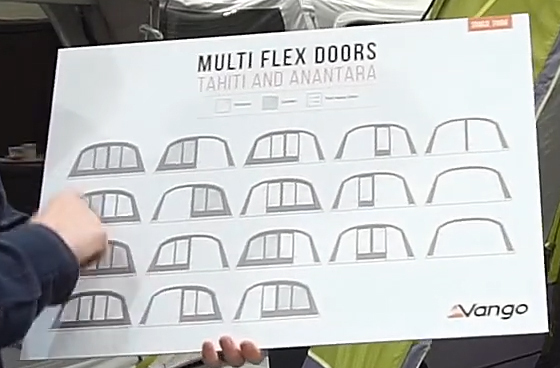 If you would like to read more about this, or any other campervan awnings you can find an impressive range from Vango, Outwell, Kampa and Easy Camp here. Battery drain and erosion are both a hiker's, and a family camper's, idea of hell. Imagine, it's 3am, pretty chilly out, everyone is asleep and typically, you are desperate for the loo. You go to pick up your torch and flick it on to the lowest setting, and nothing happens. You take the batteries out with the purpose of rolling them around a bit hoping to coax just a bit more power out of them, and as you take them out of the torch, you feel the unmistakable crusty, flaky feel of rusty, corroded batteries. All because you didn't check the batteries! Well, Coleman have now got you covered for situations like this. Whether the batteries have drained themselves or corroded, Coleman's brand new Battery Lock system quickly and easily disengages the battery, without you having to physically remove them and then, undoubtedly, lose them! 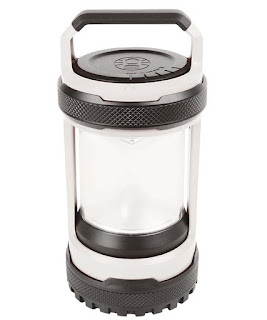 Starting at a very modest £19.99 (Duracell batteries included), this collection of lanterns, hand held and head torches are sure to be paving the way for prolonging battery life in no time! Standard electric lights lose their power over time, even if they are turned off. 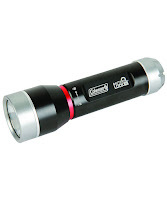 This is because the battery is still in contact with the connection points of the torch, meaning it slowly but surely drains the power from it. 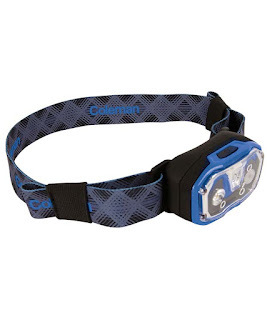 Coleman's new system is patent pending, but it means that with a twist of the hand, this problem is solved, and battery loss will become a thing of the past! Check out the Coleman section of our website, or have a look at our full range of torches (both hand held and head torches) here! If you have any queries on how this works or why it happens in the first place, give us a shout and we will do our best to enlighten you! May Bank holiday is upon us and the weather looks like it's going to be glorious! Perfect for a spot of camping and some alfresco dining maybe! when at the basket stage to receive this additional discount. Summer camping trips are possibly one of the most rewarding way we Brits spend our holidays and is a great way to create fantastic memories with loved ones. Of course one of the key elements to your enjoyment of a camping holiday is the tent itself, and not all tents are created equal. If you have spent anytime camping you'll know this to be true, especially if the weather turns and leaves you with a battered, leaky tent which in turn leaves everyone feeling pretty miserable. 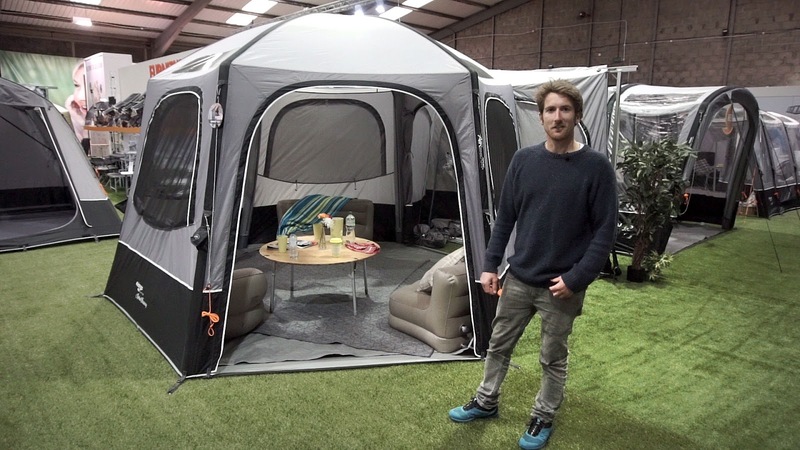 That said a quality tent doesn't have to cost the earth either and there are plenty of brands coming up with great innovations and technologies that make the whole experience of camping even more enjoyable. We've compiled a list of our top 5 tents to suit a range of budgets and tastes detailing our thoughts and even some alternatives. 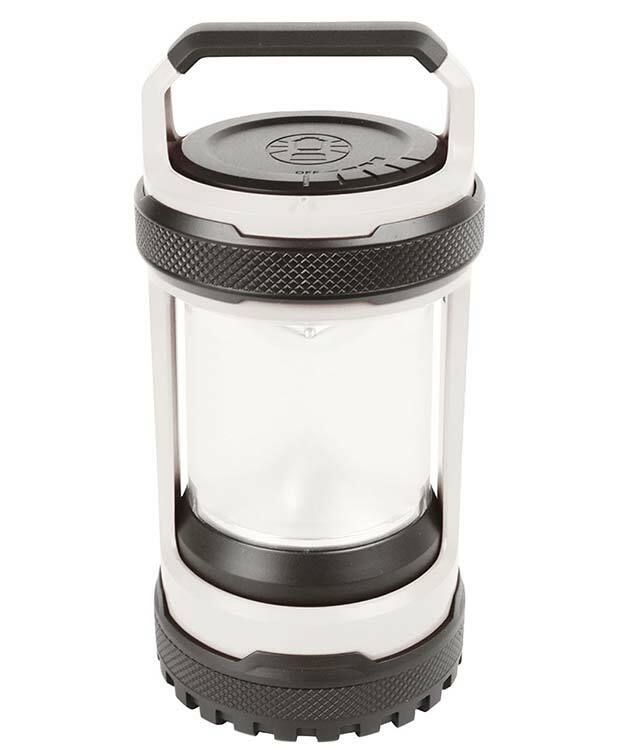 Maybe it's your first camping trip or maybe you're just looking for a bargain. Well this would be it! The Drummond 400 tent by Vango sleeps up to four people comfortably, has a spacious living area for a smaller tent and best of all offers full head height. We also like the darker, 'lights out' fabric that's used in the bedrooms which increase your chances of a lie on bright sunny days and the removable bedroom divider. Not content with 'normal tents', want to standout from the crowd? How would you like your very own circus tent? At least that's what we think it looks like! 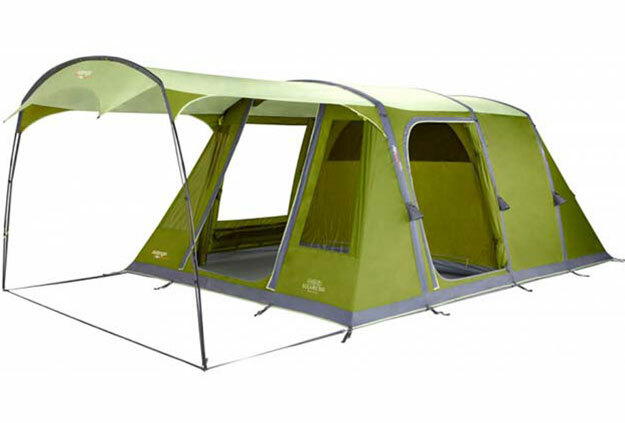 Coleman's Cortes Octagon 8 tent won Camping Magazine's 'Tent of the Year' Award in 2015 and we can see why. 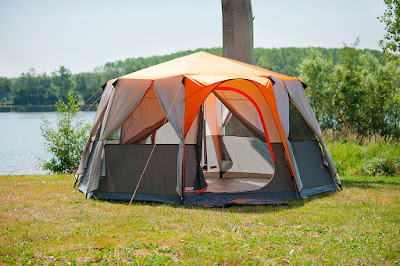 As far as we are aware there are no other octagon shaped tents on the market but maybe there should be. 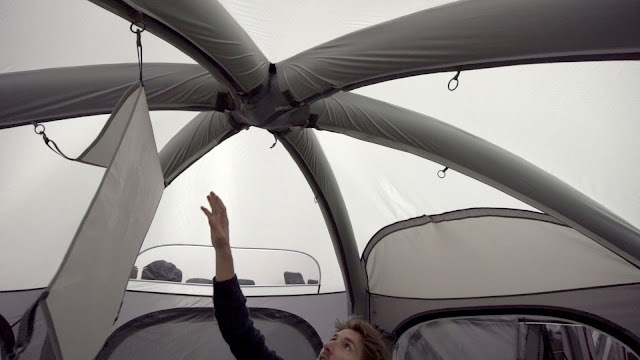 Its' unique shape and 360° wrap around windows makes the tent feel far bigger than it really is. Even though it's classed as an eight man tent you wouldn't realistically want to sleep more than four, or two if you'd like to make the most of the Octagon's layout. 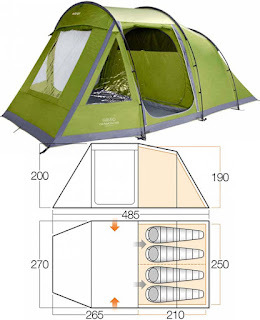 There is a divider which splits the space in two but that kind of defeats the point of the tent in our opinion. Not sure about the Octagon 8? Why not consider a podded tent. Vango's Palermo 800 AirBeam tent is a true eight man tent with three bedrooms, one of which can serve as an alternative entrance. 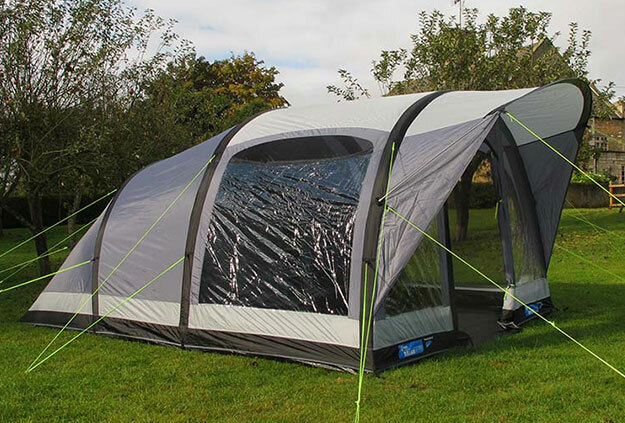 The Palermo has an rrp of £950 compared to £329.99 rrp of the Octagon so is quite a bit more expensive but to be fair it's a lot more tent with more durable fabrics and easy pitching AirBeam technology. Inflatable tents are a relatively new development in tent construction but have been incredibly popular due to the speed and ease of pitching they offer. As with any new technology, prices of these inflatable tents were initially quite high compared to standard poled tents, but a few years on they are now quite affordable. So which one is the best that won't break the bank? 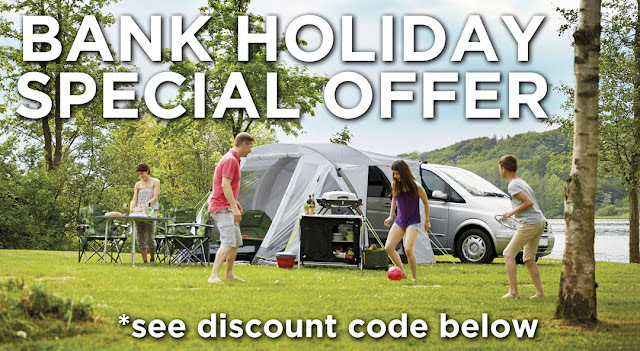 Well we narrowed it down to three with the Kampa Brean 4 Air Tent coming in the cheapest at just £399.99. 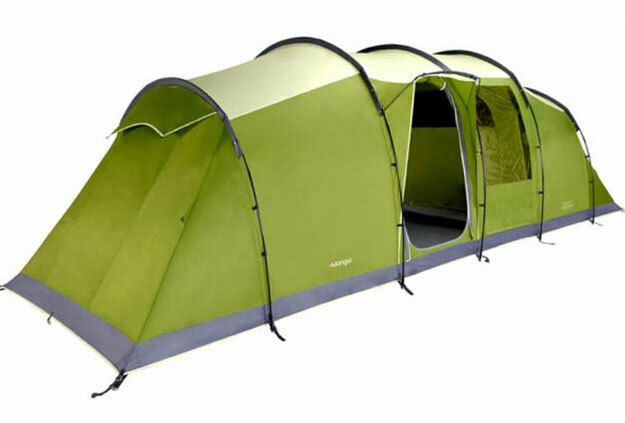 The Solaris 500 from Vango (£500) and Coleman's Valdes FastPitch Air 4 tent (£699.99) which is brand new for 2016. While we'd love to say the Valdes 4 is our recommendation the fact that Solaris sleeps five makes it that bit more usable. 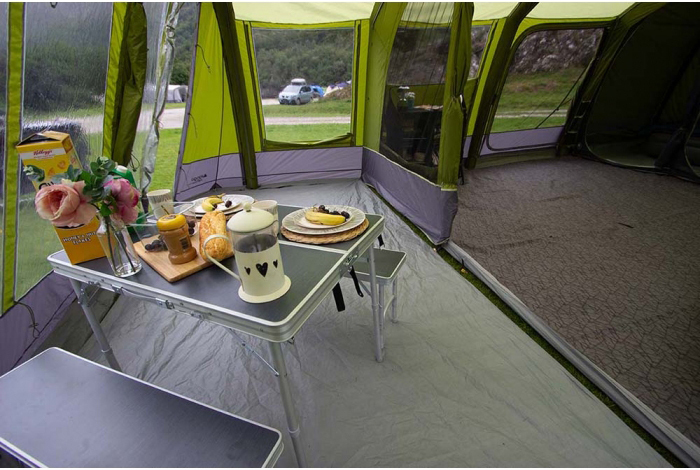 The Vango also features a sizeable canopy that provides an ideal area to cook or to relax in the shade. It is of course also that little bit cheaper. The traditional poled tent hasn't had it's day yet, and if anything, the introduction of inflatable tents has brought their prices down. This means you can get a lot more tent for your money. The Kampa Croyde 6 for example is a large tent with loads of living space and three bedrooms that sleep two in each. It's inflatable equivalent, the Croyde 6 Air, is almost twice the price yet for all intensive purposes is the same tent. This has been a popular tent ever since it's introduction and is definitely a favourite. For something a little different the Vango Stanford 600 offers a vis-a-vis style layout with loads of quality features such as durable fabrics, TBS and ample living area. 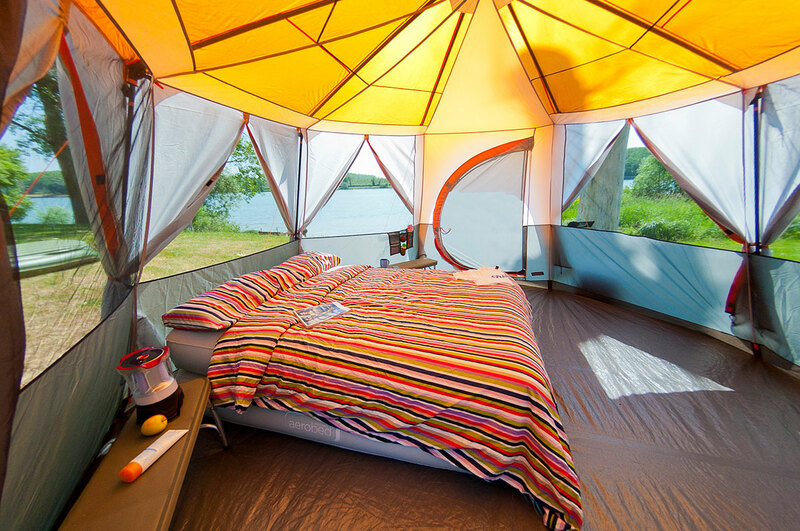 For those who want the best and most luxurious camping experience there's only one type of tent that will do. Polycotton tents, which are undeniably expensive, but when it comes to durability, breathability and overall sense of Zen like calm polycotton outperforms any other fabric available. Don't get us wrong, modern polyester fabrics are great and offer fantastic durability and waterproofing at a much cheaper price. Polycotton however, is inherently waterproof and naturally breathable. It's fabric contracts when wet and expands when dry and also provides good insulation levels for a tent. This insulation not only regulates temperature exceedingly well but also proves to be quieter, cutting down on wind noise in a breeze. Three tents were in the running for our top luxury tent the Kampa Studland 8 Classic Air, Outwell's Harrier 6AC and Vango's Studland 800XL. 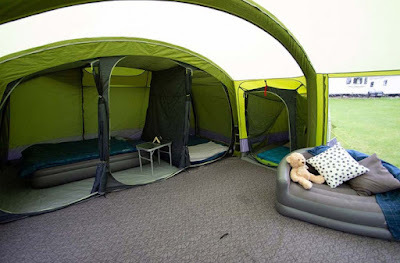 All three of these tents feature polycotton fabrics and are inflatable with the Harrier inflating from one single inflation point and the others from each tube in turn. 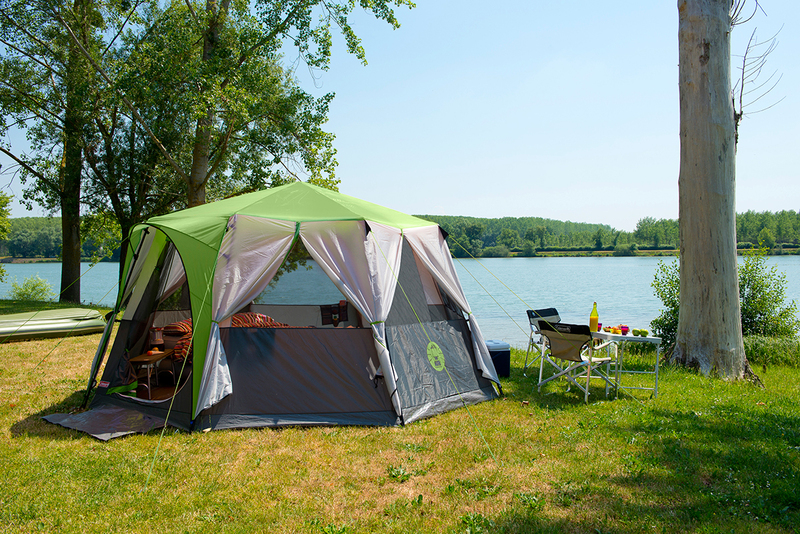 While all three tents are exceedingly good we think the Studland 8 Classic Air from Kampa just steals it. Why? Well both the Kampa and Vango can sleep up to eight whereas the Outwell only manages six and the fourth bedroom in each can be easily removed to gain more living space. There are also large windows throughout that are easily adjusted to provide just the right amount of privacy. But the Kampa is slightly larger and when going for out and out luxury size does matter, especially when both tents are can be found for a similar price (£1500*) even though the Kampa's rrp is over £2000! So there you have it! We hope this article has been helpful. If you would like to have a look at our full range of family tents head over to our website where you'll find all the best tents at truly competitive prices. Opinel are a French maker of knives. With several sizes/styles. 08 being the specific size of the knife in question today. 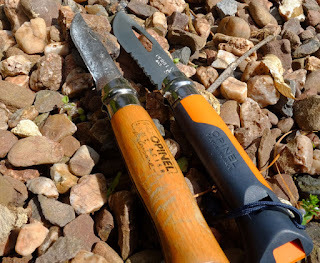 I have always been a fan of the traditional Opinel knives, ever since I bought my first in a French supermarket 20 years ago. They use a very high carbon content blade. This is similar to some high end chefs knives. They do not use stainless steel, and as such the blades do tarnish, look dull and can rust. However look after it and clean it correctly after use, and it is one hell of a sharp knife. The edges these things are able to hold are astonishing. I was after something similar to the traditional one, but different. Something perhaps a little more outdoors oriented. A few years back when I was living in Morzine, I walked past a hardware shop daily, and spotted the Opinel No 8 Outdoors knife. I walked past it day in, day out for months. Contemplating the knife. Nothing became of it, until I saw it more recently. The knife is the classic folding Opinel design, it has a metal "virobloc" locking system, used on all of Opinel’s knives. Simple but effective. So I bought the knife. It has a loud survival whistle built in to the handle, a partially serrated blade, and the thumb nail-knife pull-out is hollow, and can be used as a shackle key (Something to do with boats I believe). So the knife feels good in hand-exactly the same geometry as the traditional beechwood handle. The knife is sharp. Sharper than I thought being stainless “Inox” steel. To test the knife I thought I would do some bushcraft styling, and do my best to create a fire drill kit. Normally a fixed tang knife is tougher for this kind of wood re-shaping, but hey. 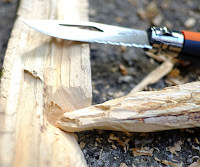 The outdoor knife is a survival knife-so I gave it a go. I have never started fire with a fire drill before, but am aware of what is required. 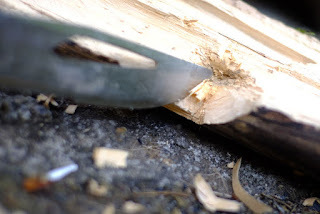 I found a big lump of wood-, and managed to split it, using the knife as a chisel/wedge. Locked with the locking bit. The wood turned out to be an old seasoned hardwood branch-from either Ash or Beech. The wood was hard, really hard. However the knife, it took some effort, but it did what it does. 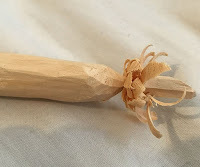 The serrated bit sliced as a plane, and the sharp end, used as more precision. 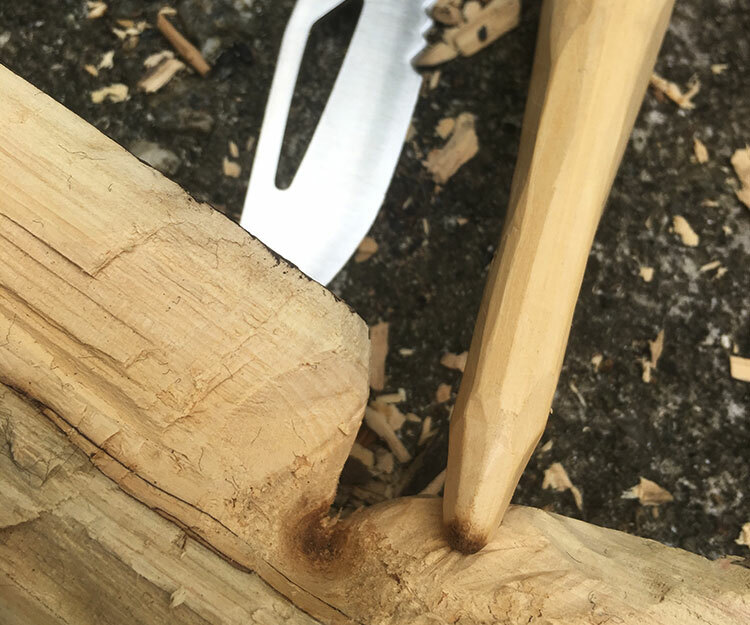 It was a joy to shape the wood. I got quite obsessed, to the fact I started wanting to decorate my drill spindle. I decided not too, as my first careful blade sweep cut deep in to my thumb, and sent blood dribbling all over the gorgeous pale wood. The knife is a corker. I have created all parts of the set now, and am simply looking for a specific cord to string the bow with. The set has darkened from working it, so I am confident it will light. However I may have to give it a few days, or at least until i can use my left thumb again. So the knife I was impressed with. Even now, the blade is sharp. I have done my best to blunt it, but it is still incredibly sharp. So I was very impressed. The only one part I was not so keen on was the lock. On my knife, even when fully locked the blade moved a mm or two. Although this isn't a problem, as it is still locked, and as such cannot fold on your fingers, I felt the lock should be absolute-like their traditional Beech handled ones. Perhaps it is an issue with the moulded mana made handle-who knows. Despite this I like the knife a great deal. Even though it hurt me. It folds up small, it is light and comfortable to use. This post was kindly supplied as guest post from the good people at Kernow Outdoors writers of independent outdoor gear reviews and stories of their travels around the world. If you enjoyed this article and wanted to read up on the specs of the Opinel No8 knife you can find it on our website HERE.